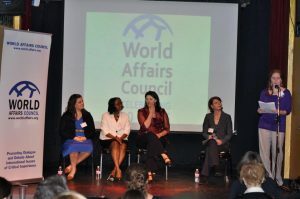 On March 15th, 2012 Channel partnered with the World Affairs Council to highlight three Channel grantee partner leaders. Speakers included Jackee Budesta Batanda, Ugandan 2011-2012 IWMF Elizabeth Neuffer Fellow at the Center for International Studies at the Massachusetts Institute of Technology and Global Press Institute Reporter; Cristi Hegranes, Founder & Executive Director of Global Press Institute; and Jensine Larsen, Founder & CEO of World Pulse. The panel presented these women and their work to help expand the voices of women around the world. Cristi Hegranes discussed the work of the Global Press Institute in training women to become journalists who can speak up about issues that are not covered by mass media. Jensine Larsen spoke on World Pulse’s efforts to provide access for women to become grassroots change leaders by providing media and training to allow them to talk about their communities. 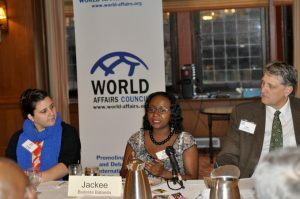 Jackee Budesta Batanda talked about her on-the-ground experiences as she has worked to tell the world about under-reported issues in Uganda.